Haiiiii-Ya! 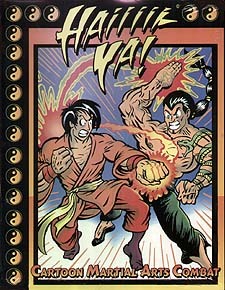 : Cartoon Martial Arts Combat! Outrageous Japanimation Action bursts to life with Haiiiii-Ya! : Cartoon Martial Arts Combat! Create your favourite japanese anime Fighter, then add Martial Arts Styles, Special Attacks, Signature Moves, Combat Options, and a wide variety of hilarious Chi Powers like Star Energy Shuriken! and Tsunami Water Smash! Increase in Power and Rank, then decimate your opponents in one-on-one or mass gladiatorial combat! The Fight Is About To Begin!